Did you ever wonder why your hummingbird feeder is empty every morning during the late summer? This medium-sized bat (Lepto for short) that feeds on nectar is the likely culprit. It has no need to eat insects as it gets its protein from the pollen that it ingests while sucking up nectar from flowers that it visits. Dr. Ted Fleming, an emeritus professor in the Department of Biology at the University of Miami, has carried out extensive studies on this critter’s role as a pollinator of large columnar cacti (and Agave) beginning in 1988. Many of these female bats spend winters in caves off the coast of the Mexican province of Jalisco where they mate with males in November and December. They then journey about 700 miles and establish large maternity colonies of tens of thousands in caves near Kino Bay in Northwest Mexico or in Southwest Arizona. They arrive at our feeders in Tucson near the beginning of August and leave to head South around mid-October. 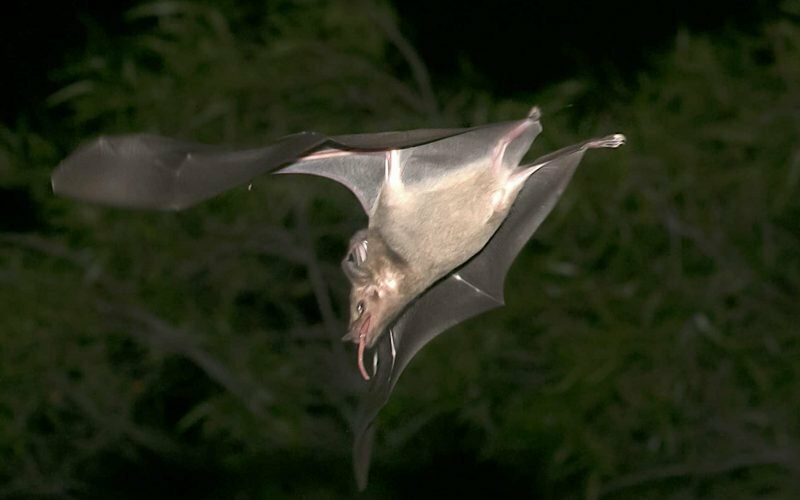 Comparing samples of mitochondrial DNA from bats in Jalisco and Tucson have confirmed that our summer bats actually come from Jalisco (mitochondrial DNA is only passed down from the mother). Studies near Kino Bay have shown that Lepto females fly long distances every night from their maternity caves to obtain food; as much as 30 miles each way. They appear to be very fussy about where they raise their young. These particular caverns are far from the columnar cacti that they are feeding on. Their choice of caves has to do with where they feel safe from predators and where they have enough space so that the large numbers of individuals in a given cave provide sufficient body heat for energy allowing the babies to grow quickly. They are very muscular and their long, narrow wings and lack of drag from a tail (the lack of a tail is obvious in one of the photos) make them very strong fliers. A 60-mile flight in a night is easy for them. They can fly 30 mph. Dr. Fleming has studied the flowering characteristics of Cardons, Saguaros and Organ Pipes. His findings are important in determining what critters are responsible for pollination of these large columnar cacti of the Sonoran Desert. In this regard it is important to note that Cardon flowers open at dusk and close at dawn (suggesting nocturnal pollinators only); Saguaro flowers open at dusk and close late morning (suggesting the possibility of diurnal pollinators); Organ Pipe flowers open before dusk and close at dawn (also suggesting the possibility of other than nocturnal pollinators). 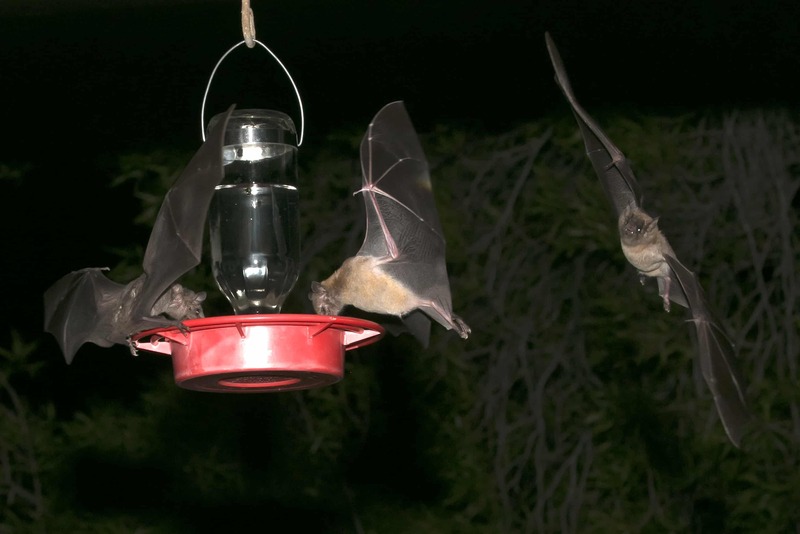 By covering some flowers at night and others during the day and seeing which flowers set fruit (“exclusion experiments”) he has determined that whereas Cardons are entirely dependent upon nocturnal pollinators such as bats, Organ Pipes seem to mostly rely on hummingbirds and Saguaros, especially in Southern Arizona are most likely pollinated by White-winged Doves. Bats arriving in the Tucson area at the beginning of August will not find Saguaro flowers to pollinate, nor are Agave flowers abundant at that time. Since they require pollen as a food source, hummingbird feeders alone will not suffice and it is still somewhat of a mystery as to what they are feeding on. These bats are really fun to watch. They move very fast and are highly maneuverable. They come towards the feeder at high speed, appearing as a blur and then stall for about ¼ of a second while they shoot out the long tongue to obtain the sugar water. Then they are gone. As of May 1, 2018, U. S. Fish and Wildlife has delisted the Lesser Long-nosed Bat as an endangered species. According to Dr. Fleming it was a mistake to list them in the first place as they were never endangered.